What does SO6 stand for? SO6 stands for "Special Operations Group 6 (Specialist Crime Unit, or Fraud Squad)"
How to abbreviate "Special Operations Group 6 (Specialist Crime Unit, or Fraud Squad)"? What is the meaning of SO6 abbreviation? 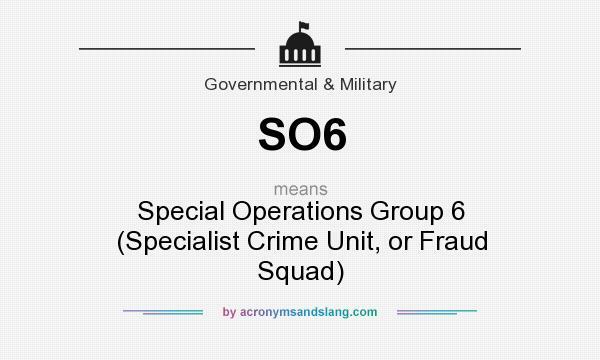 The meaning of SO6 abbreviation is "Special Operations Group 6 (Specialist Crime Unit, or Fraud Squad)"
SO6 as abbreviation means "Special Operations Group 6 (Specialist Crime Unit, or Fraud Squad)"